Chadstone Food Forest is an urban food forest located in Batesford Reserve, a public park in Chadstone. The area is managed by the group of community gardeners. 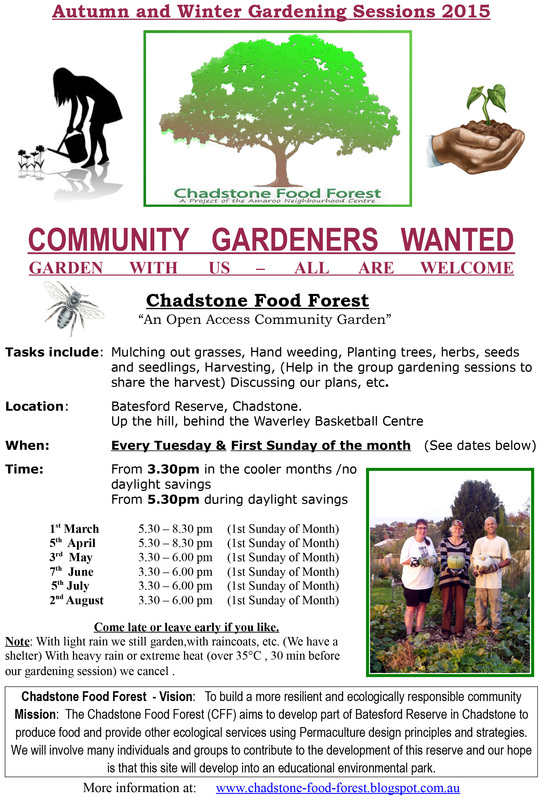 The Chadstone Food Forest is a project of the Amaroo Neighbourhood Centre and is supported Monash Council. We garden together on the first Sunday of each month and Tuesdays from 3.30 – 5:30pm in the cooler months and 5.30 -8.00 during the warmer months (during the daylight savings period) We get together at the Chadstone Food Forest to look after the fruit trees, plant new edibles and plan future activities. Please join us. All welcome! Batesford Reserve (up the hill and behind the basketball stadium), 94 Batesford Rd, Chadstone.